Did you just get a new iPhone? Do you want to move everything from the old one to the new one? No sweat, we’ll walk you through the two absolute easiest and most pain free methods to migrate everything from that old iPhone to the brand spankin new iPhone 5s or 5c. Transferring everything from iPhones is a lot like migrating iPads, so if you’ve done that before you’ll be in familiar territory. If this is all completely new to you, don’t worry because it’s very easy. This is by far the easiest method and it doesn’t require a PC or Mac, but it relies on having iCloud set up on the original device. If you don’t have iCloud set up or you have a slower internet connection, jump to the iTunes method below instead. When finished, your new iPhone will have everything from the old iPhone and you’re ready to go! Is that easy or what? If you don’t have iCloud or your internet connection is slower, the iTunes method below is also quite easy. Don’t have iCloud setup? Or maybe you don’t have enough iCloud storage to backup to it? No big deal, you can use iTunes to perform the migration. You’ll need a Mac or PC though, so it’s not quite as automated as the aforementioned iCloud method, but it’s still extremely simple and it may even be faster for some users who have slower broadband connections. If you’re impatient and just want the fastest way to migrate everything over and don’t mind connecting it to a computer, iTunes is the way to go. I Already Used the New iPhone, How Can I Get Back to the Initial Setup Menus? Any questions? Let us know, otherwise enjoy your new iPhone! If you purchased Audiobooks on the phone you’ll need to transfer purchases with iTunes before transferring. Audiobooks seem to have fallen through the cracks. They’re not eligible for iCloud redownload, or iTunes Match, don’t download to iTunes on the computer after purchase (and check for available downloads), and aren’t included in backups. Great thanks! I’d started from an iCloud back-up but was taking forever, so needed to restart- perfect instructions! My old iPhone is of course on iOs5. The new one will normally be on iOs6. Does that make a problem ? Do I have to update my old iPhone to iOs 6 before doing the save / restore ?? No. Just updated your iTunes to the latest version. Then you can restore data from old iPhone backup to a new iPhone. Note: Restoing data from a backup to iPhone may erased the current data on your new iPhone. If you have data on new iPhone, you can try a 3rd party utility such as Backuptrans iPhone Data Transfer to transfer and merge the data between iPhones. When I synced my new iPhone allof my photos from iPhoto are now on my phone. Can I delete them from my phone? iTunes 7 and IOS 6 is not allowing the iphone 5 to restore from your latest backups! It gives me two dates in 2008,one date in 2009,and the latest choice is one in 2010. If I allowed it to sync or restore,I’d lose two years of info. My Daughter lost 2 years of info. from an icloud backup that was one day old,and the most recent backup from her MacBook. What do we do to get our most recent backups on the iphone 5? we can’t afford to lose two years of information! I can’t let my iphone 5 sync,and I’ve got to carry my iphone 4 with me,in order to have my Contacts,etc.. HELP! @Ivan Marshall The current version of iTunes is 10.7.You might have better luck once you have updated iTunes. Hi, I am having a similar problem, I have backed up my old iphone to itunes and icloud, I then try to set up my new iphone and restore the last backup. The restore dates back to March 2012. I have followed the process three times with the same results (Einstein’s definition of madness, I know!!!). One important thing should be added to it: when you use 2-factor-authentication apps like Google Authenticator or the Battle.net Authenticator, there are special steps required, so that you can migrate those apps as well and use them on the new iPhone. That’s just to make sure, that you don’t lock yourself out accidently. I’m restoring from iTunes… Does it really take 9 hours? I’m moving from 4S to 5, both on iOS6. I’m pretty flustered, my service was switched to the 5, but it’s unusable duing restore. So I’m out of communication for 9 hours? Really? Hope this helps someone… I unplugged the phone from iTunes. The phone rebooted itself and had me start the setup process over. I selected restore from iTunes, but this time I actually see the device is syncing my apps, music and photos. (before it was stuck in the “Restoring from iTunes” mode) I’m sure it will be done inside of 30 minutes this time. Thanks for the easy instructions, used the iTunes method for best speed. Backed up iPhone 3GS/32GB/iOS5, restored to iPhone 5/64GB/iOS6. Initial config, restore and reboot took less than 5 minutes, after reboot App restore also less than 5 minutes. Music, iBooks, & Pictures (~20GB) took about 2 hours, so to answer the question above about time, it will depend on how much data your phone has. One comment though, I can’t imagine iCloud ever being faster than a direct iTunes connection, though possibly more convenient. Thanks again. I backed up my iphone 3GS onto iTunes and tried to restore contacts, pics, notes and text messages onto the iphone 5S but an error keeps occurring! Can anyone help and give advice? I’ve followed the above instructions 3 times and still the same result – nothing! Thank you. What error are you seeing? Try using iCloud if iTunes is failing too. I would not restore an iOS 5 onto a iOS 6. Weird troubles will follow. Just re-setup. This has saved me from all the issues that get reported when a major OS upgrade is released. my music files did not transfer – can you help or do I need to try again? My music files did not transfer, either. How do you transfer music files from one iphone to another? You would think it would “just work”. But apple seems to have gotten away from that. I want to transfer selected files and photos from old iphone to iphone5. can i select the files i want transferred or do i have to transfer everything. thanks. I’m having a hard time syncing my new iPhone 5 with my old iphone4. Everytime i sync from my most recent back-up photos and text messages from up to 7 days ago show up and nothing newer. i tried backing up several times tonight and restoring my phone from the newest backup but still same problem. as many times as i restore my phone to factory settings and retry still same issue.. PLEASE HELP! Will this process make my new phone look exactly like the old one? My wife hates change and doesn’t want to lose anything that is on her old phone. 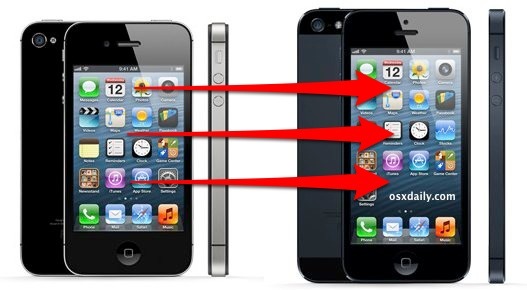 The SIM card on your iPhone 5 is different than your previous iPhone 4S, 4, 3G, 3, if you are a part of the AT&T mobile network. Go into a local AT&T store or telephone 611 on your mobile phone, to find out how to get the new SIM card. If you pre-ordered (as I did), it came with a new SIM card (which is smaller) than I had in my iPhone 4. If you are with another mobile phone carrier, contact them how you regularly do and find out what you should do with your particular service. What do I do if the pre-ordered iPhone 5 I ordered, came with a new SIM card, but states, “no service.” I have already reset everything on my old iPhone 4… so now I have service on no phone. Guess I should have waited until the iPhone 5 had cellular service, and not just wi-fi service on my network. Ugh. I had same problem. What you do is go to your provider website and access your old phone. There should be a place to change SIM cards. Enter the old 20 digit sim number and the new 20 digit number and proceed. Then reboot both phones and the new one should work. I want to put all the data from my iphone 4s on my 1phone 5, but i have already been using my iphone5 so there are pictures and other stuff on it I do not want to have to delete when i transfer everything from the other phone. Am I able to take my pictures off of my iphone 5, put them on the computer and then factory reset my phone and use icloud backup? I just can not risk loosing any of the items I already have on the iphone5 when i do the icloud backup.. How do i do this? HI, i have the same dilemma, just wondering if you found a solution? Have you tried Image Capture Aplication? Backed up 3G, resored to iPhone 5, got all back, but no apps. Why? How to do this right? You have to sync the apps with your itunes first. Then back up and restore. Thank you so much!! !so easy & most imp that damn newstand app stayed in its box!! Hello, I’ve recently received my AT&T iPhone5 and I’m trying to restore from backup via iTunes from a iPhone3Gs with 6.0.1(up-to-date as of 11-8-2012.) When everything is finished, my applications and pics are not transferred, only the Audio and ‘Other.’ I’m not sure what the ‘Other’ is, but I’m most concerned with the applications and pics as there are many apps (about 150) So, I don’t want to go through and add them all one by one, I’m not even sure how to do that-at this point. Has anybody else had this issue? Thank you so much! This has helped me a lot as I’m trying to transfer info from iphone 4 to iphone 5 for my mum :) Thank you! I did a backup with my old iphone 4 on itunes , now i connected the new iphone 5 with itunes, but no device i coming up. don’t know what to do :(? i just recieved my iphone 5 i activated my new sim transfered number and transfered from iphone 4 to the iphone 5 only proble i have is if i deleted a picture from ihpone 4 and it deleted from the iphone 5 aswel?!! im now scared to delete all the stuff from the iphone 4 for it to do it to the iphone 5 pleaseeeee help??? GREAT IDEA …WAS DONE IN 5 MINS…BUT MY APPS DID TRANSFER FROM MY OLD IPHONE 4S TO IPHONE 5 …NEED HELP ??? Great instructions. I had just backed up my old iphone and just needed to reset and wait for the sync up. Thanks! Thanks a lot!!! made my life easy!….. simple and easy to follow steps. I used the itunes method so i didnt have to ‘restore factory settings’ which was great!!!. Thanks again! if i restore the new i5phone to factory and connect to itunes on computer will i be able to restore from my iphone 4 back up?? I backed up the 3gs and restored to the 5. However none of the apps transferred. Now can’t figure out how to get the apps on the iphone 5 at all without selecting them one at a time. This may seem like a dumb question but does the backup include the pictures on your iphone or do you have to save them manually? It worked and THANK YOU!!!! Of course, I had to do the “I Already…” portion, but it worked without a hitch. Very appreciative of the help!! The icloud backup indeed brought over all the application availability via itunes and the contacts came over. No texts. And more seriously disturbingly, NO MUSIC. My entire library is still locked on that old 4s and the 5 has not ONE piece of music transferred over. WHAT IS THE SOLUTION??? Can someone just give a clear and simple answer to what ought to be a clear and simple question? IT almost seems like its a rudimentary thing to ask. It should be automatic and transparent. I backed up my old iphone 5 but when i was setting up my new iphone 5, i clicked set up as individual phone, now it won’t let me get any of my pictures from itunes from my old phone, is there anything i can do? This did not work for me at all. I had to create a new iTunes on my work computer since I did not have my laptop. Does that matter? None of my pictures, contacts or apps are showing up. I did the factory restore and everything. I am going from a 3Gs to a 5. You have to use your old backups, whether they are from iCloud or iTunes, but without your original iPhone backups you won’t be able to bring everything over since it has nothing to read from. If your laptop is what you originally backed up the iPhone 3GS to, use that backup to restore the iPhone 5. I thought if you did a backup on any iTunes and then did a restore on the new phone it would work? Thanks. I don’t understand. I just bought a new iPhone 5, backed up my old iPhone 4 to the Cloud AND to my computer, and restoring the backup to the new iPhone gives me nothing. My contacts, maybe, but no apps, no configurations, nothing. What am I doing wrong? I just bought a new iphone 5 today. I backed up my 3Gs in itunes and then connected the new iphone 5. I went to hit restore from my old 3GS phone but it refused to let me, saying software on the phone was too old. I then updated to ios 6.1 on the 3GS and updated the software on the new iphone 5. It then told me that I’d need to register the iphone 5 as a new phone in itunes and then manually restore. Does anyone know how to do this? I have a new iphone 5 with nothing on it. No contacts, no music, no calendar, no nothing! Can anyone help? I can’t seem to find an answer when I google – and short of taking my laptop and both phones to an apple store tomorrow morning, I don’t know what to do! I followed all of the steps but it keeps asking me for a password. I have tried every password imaginable and it won’t take any. What do I do now? Then finally restore to your new iPhone. Why we have to transfer our purchases is a complete mystery to me.. By design a back up and restore makes a backup and restores the full contents, nothing’s perfect i guess..? I talked to apple support. They said music is not included in backups. I mean music that was not purchased via apple store. Like music grabbed from my own CDs. That tells me one thing. Apple did not figure out yet, what the concept of a backup is. I am packing my 2 brand new iPhone 5 devices and sending them back. See, Apple wants me to manually handpick 1000 songs out of my 20 000 song library again. That’s what I call pathetic. I have a back up and it comes up in devices but i cant put it on my phone please help me? iTunes could not restore the iPhone because the backup is not compatible with the iPhone being restored. Going from 3GS to iPhone 5S via iTunes 11.1.3 (8). Hi. Just got iPhone 5c which is on iOS 7- all my back ups are on IOS 7.1.1 so it won’t let me sync up. Downloaded 7.1.1 onto new phone and then tried erase phone to start again and if course…it’s erased everything so I’m back to square 1!!! Any help gratefully received. Get the new iPhone 5C onto iOS 7.1.1, then restore the iPhone 5C from your prior iOS backup when setting it up (that you had previously made to iCloud or iTunes), that’s all there is to it! We’ll I did what it said to do then I remmbered I have old restructions on my old phone and don’t remimber the password so I don’t want to mess up my new phone so what can I do? I’m going from iPhone 4 to 5c I have backed up my iPhone 4 but I am getting rid of my 4 today And not getting my new until tommorow! Will this still back up? trying to restore from backup (backup done today) from 3gs to 5s. looks like it wants to work and then ‘when done’ after i tues says wait for the phone to restart, and it does the narrow white horizontal line under the apple – it looks like the resotre is there for a second and then it is back to the hola screen – restore from backup did not hold. no errors given. here are the numbers…3gs ios 4.3 to 5s 7.something..using itunes 12.1.2.27. I think it’s not the best way to use iTunes and iCloud. just activated a replacement phone and my apps didn’t transfer. HELP!!! Be sure you use an encrypted backup on the first iPhone (with iTunes) or use iCloud. Then use that encrypted backup as the new iPhone backup to restore from in the transfer. That will move your apps, your data, etc. Good luck! When I transfer my data (on Iphone 4) to my new iphone 5, will my game-progress be deleted? Or saved?